A Slice of Life: I want this! I want this! I want this! I want this! Seriously, even though i already own a Canon Rebel Xti (EOS 400d), i am still drooling over this and I am dreaming of having a Nikon cam someday (perhaps on my b-day this Nov. or at Christmas time??) What you think?? 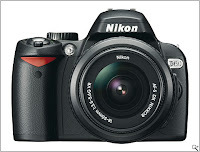 I know, i know i just got my DSLR last Nov. and now i am still planning to get a new one? Hey once you get into photography i gues you can't get enough of good cameras. 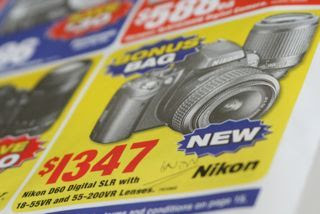 Look I even saw at the product catalogue here, Nikon D60 is priced at AUS$1,347 (around Php 52,000) with 2 lenses: 18-55mm and 55-200mm lenses, and free bag. Hmmmm... i guess it's a good deal but right now I will just wait bec. I know by Christmas time, the price will go down. So what is your DSLR cam?